Ecuador seeks to match Brazil and Venezuela, the pioneers of electronic voting en South America. In May, the Electoral National Council evaluated three alternatives to automate the electoral process from 2013. Even though it seems as the first steps to modernize the voting process in the country, reality is that in 2004 Ecuador tested a pilot program with 160 machines supplied by the Brazilian government. The successful results were taken into account for the implementation of electronic vote that started on 2006. The electoral authorities held a technological fair, where 5 companies (Voting Solutions Inc, Premier Election Solution and Smartmatic, as well as Escuela Politécnica del Litoral and Kruger) presented their proposals for the automation of the electoral process in the country. However, it was until 2008 when electoral automation gained the status of execution plan, considering adopting Venezuela’s technology to partially technify the voting process of 2009. In that time, Fausto Camacho, spokesperson of CNE informed that the electoral body contacted Venezuela to acquire the loan of 15 thousand machines from Smartmatic. Due to the proximity to the elections this wasn’t possible, but the need of providing a modern, safe and transparent electoral system for the country became an important issue. – The use of a mechanical pencil, similar to the voting action of the manual vote, which allows the recording of the election into a database. The initial budget the Ecuadorian government has to acquire this technology is 145 million dollars, which will be invested in a progressive way during the next three years, investing 17 million dollars in 2010. The interest of Ecuador for this technology shows, besides the intention of complying with the law that orders the automation of the elections, that it has developed a plan that accelerates the implementation of e-voting. The political will is the only thing missing for the approval of the resources to make the project viable. The Ecuadorian electoral process states that the e-vote will give reliability and speed to the results, and will help the environmental depredation. All of this makes us think that in Ecuador everything is settled, the only thing missing is that the citizens benefit from automation. The engine of any automated electoral process is the voting machine. How it works, what opportunities are offered and what guarantees are made available, are some of the most common questions usually made about the tools that technology has produced to make possible more rapid and secure elections. In Latin America, Venezuela is leading the introduction of electronic voting, and in September 26th the country will test its automated system. Three machine models will be used by more than 17 million voters who will choose 165 deputies to the National Assembly and 12 representatives to the Latin American Parliament. The machines used belong to the so-called SAES series, designed and manufactured by Smartmatic, a company that for six years has been the appointed provider for Venezuela’s electoral automation. In 2004 the SAES-3000 machine was introduced to the Venezuelan public. Since then, the SAES-3300 and SAES-3300 machines were introduced to gradually renew the technology in order to keep it updated. For voters, this translates into a more effective system having several improvements, keeping the ease of use and familiarity with the machines when voting. 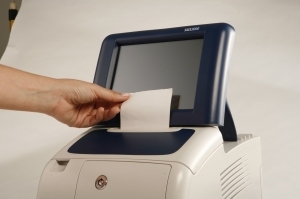 SAES-4000: One of the newer models designed by Smartmatic. 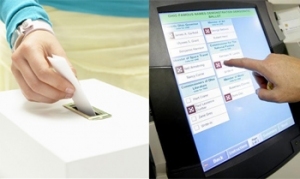 Its 10.4” touch screen gives great versatility, allowing it to be used in different types of elections. It weighs 5 kg and has a special module to facilitate voting for disabled people that can be optionally included depending on the requirements of the election. For the parliamentary elections of September 26th, most polling stations will have this model: a little over 25,000 SAES-4000 will be deployed throughout the country. SAES-3300: Designed to withstand multiple-choice electoral processes, it incorporates a space on the screen to place additional information to the selection. It has a 10.1″ touch screen and weighs 11 kg. On 26th September, there will be more than 6,000 polling stations with this model. SAES-3000: This was Smartmatic’s first voting machine with touch technology. It was designed to be flexible, lightweight and portable, yet to be fully auditable. Its deployment in 2004 marked the first automated national election in the world that implemented the VVPAT concept in actual practice (VVPAT means Voter Verified Paper Audit Trail). Since then, the SAES-3000 has been further used in ten national elections. For the parliamentary elections, more than 3,000 SAES-3000 machines will be used. •Encrypted information with multiple layers of security, using 2048-bit algorithms. •Built-in printer to print vote paper slips (VVPAT’s) and tally sheets. •Ability to communicate via telephone modem, cellular modem, satellite transmission and public and private IP networks (Ethernet). •Ability to work in places with no electricity supply, using PL500 external batteries or car batteries.